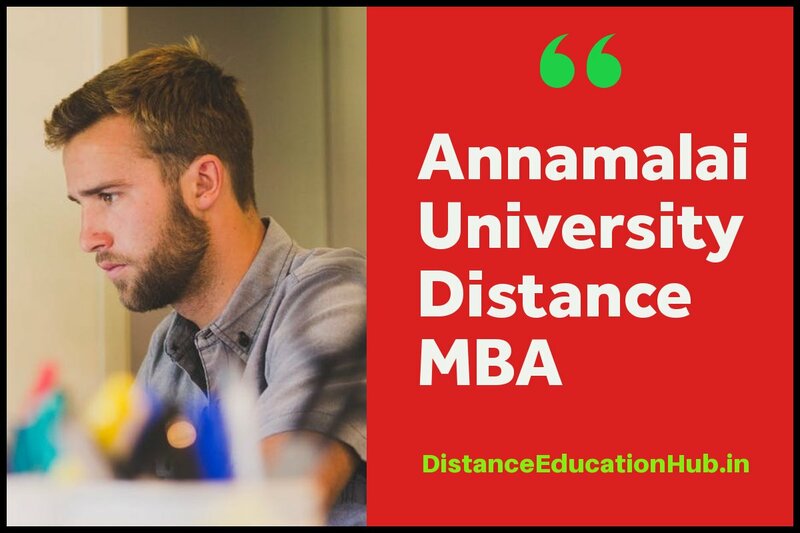 ​Annamalai Distance Education MBA course is 2 year degree programme that ranks among the top 10 distance education MBA courses in India. Annamalai University, since its establishment in 1929, has been grabbing the title of most legitimate and profound leaders in providing distance education in India. Founded in the years, where only a few were known to distance education program, the university has come a long way in terms of recognition. Having notable faculty and leaders in the industry, the university is experienced in serving the best in class distance education at the students doorsteps. The university is ranked amongst top 3 universities in India for best distance education providers. Annamalai has educated over 4.5 lakhs students in the past and continues to teach over thousands more. The university has a campus based in Canada as well, which was formed in the year 2005. Annamalai is also tagged as No 1 in respects to “Number of Programs offered in Distance Education Mode” accredited by NAAC. The programmes offered by Annamalai are approved by DDE of India and Ministry of HRD, Government as well. The Annamalai University offers the following types of courses under the distance education system. Annamalai university offers the following MBA specializations. The medium of instruction is English. Although for MBA general course both English and Tamil mode of instructions are available. Candidates are required to have achieved graduation from any recognized school and college, significantly under UGC. Although, the faculty of the university recommends that aspiring management students should have work experience with them in order to get a good understanding of the subject. However, it is not mandate to have work experience if you want to apply to distance education MBA. It is just advised to have some practical understanding of corporate arenas in order to gain a simplified understanding of the subject you pursue. Students are more likely to understand MBA better when they work side by side. The practical implementation of the subject gives a detailed understanding of the subject further helping the student co-relate all the theoretical dimensions of the management course. Students are required to purchase an application form. The final filled up form can be sent via post on the address mentioned below, along with all the photocopy documents attached. The online application costs at 300 INR. The required documents (see below) can be uploaded on the university’s website. Annamalai offers on campus spot registration and online application facility. Students may also connect with the regional study centers of Annamalai University and request quick progression of their admission. Please make sure that when you visit any of the study centres of Annamalai or the university itself, you have all the necessary documents (mentioned below) signed and fulfilled. This will help you initiate the admission process quickly. The first fee can be submitted by cash or by DD. One Photocopy each of: Marksheet of 10, 10+2 and Graduation. Photocopy of Birth Certificate to verify age. Photocopy of residential proof i.e. Passport/Aadhar Card/Voter ID card/ PAN card/Driving Licence/ Electricity or Phone Bill or if none of the above are available, please enclose the photocopy of Bank account statement. Note: Please make sure that the documents you sent are attested by a Gazetted officer. All of the above mentioned certificates and photocopies can be sent to the address mentioned below: The Director, Directorate of Distance Education, Annamalai University, Annamalainagar, Pin Code- 608 002, Tamil Nadu. Students are required to submit fees through DD to the address mentioned above. A Lot of factors depends on claiming the range of salary package that can be offered to any student who passes out of Annamalai. The university already has a reputation in the industry which does serve as a booster to your candidature. Although the average salary of any MBA graduate can fall in the descent bracket of 25,000 - 85,000 per month, but this also depends on the level of knowledge, communication skills, technical skills, industry exposure and grip on the subjects. Lot of recruiters emphasize on the practical skills of the candidate rather than the marksheets. So it is advised to compliment your MBA degree along with some work experience, so as you can accomplish a sustainable position in the industry.